Our day began with what must be one of the most scenic drives in England, on the B6160 from Bishopdale into Wharfedale. We were shrouded in low cloud as we began the ascent to Kidstones but then the sun broke through to highlight grazing cows and and trees in their autumnal glory. As we began the descent into Wharfedale the mist lifted and the wet fields shimmered in the sunlight. “It was magical the way the millions of water drops reflected in the sunshine,” commented David. Dry stone walls create fascinating patterns there, either marching down the steep hillsides or wrapping themselves round the fields along the valley. The morning mist still clung to the cliff under Kilnsey Crag with some escaping like a wraith through a cleft to the top. Just beyond Kilnsey the road overlooks a broad sweep of the River Wharfe edged with hundreds of boulders as a reminder of the force of the river when in spate. We continued south to the roundabout just north of Skipton where we took the A65 until the brown signs directed us into Embsay and to the railway station. Many others were there enjoying a warm sunny day during the autumn half term holiday. As I had bought first class tickets we could take our choice of the plush, comfortable seats in the 1st class carriage, or the chairs in the Directors’ carriage. 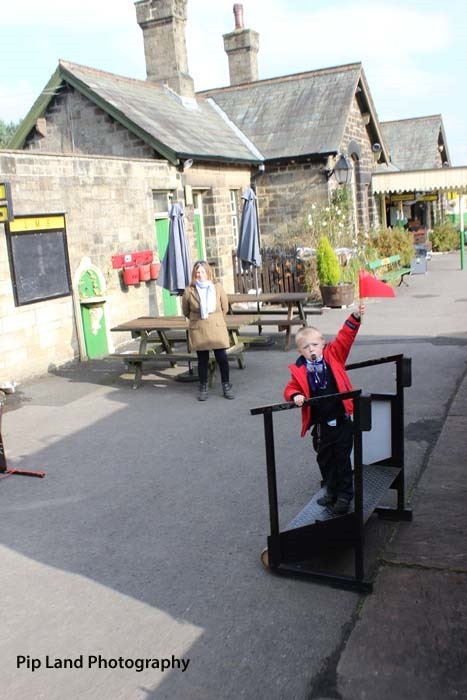 The Directors’ Carriage was built in 1906 so that the Lancashire and Yorkshire Railway’s Directors could travel in style when they inspected the route. It, and the 1st class carriage, are part of the Stately Trains fleet so beautifully restored by Stephen Middleton. 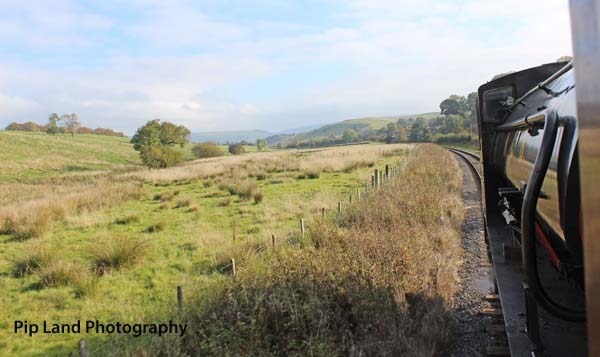 The steam train used that day for the 15 minute journeys to and from Bolton Abbey was on loan from Southern Loco Ltd and was obviously being very well cared for. One of the problems with being in the Directors’ Carriage was that there was no access to the other carriages and, therefore, to the buffet. I did buy drinks from the buffet when we were at Bolton Abbey because there was such a long queue in the cafe. We had an opportunity later to sit in the cafe and have a drink because we returned by car from Embsay. After our train journey David had inquired about buying any spare parts from old carriages and we were told we would have to discuss that with Tim at Bolton Abbey. In the early 20th century British Kings had used the railway to visit The Dukes of Devonshire at Bolton Hall. Many tourists also disembarked at Bolton Abbey from 1888, when the line was opened, until it succumbed to the Beeching Cuts in March 1965. 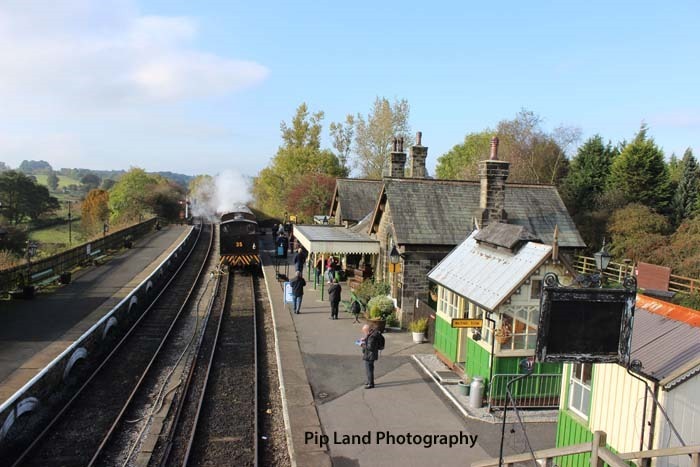 The Yorkshire Dales Railway Museum Trust (YDRMT) was formed a few years later with its volunteers first renovating Embsay station. Slowly the line to Bolton Abbey was reinstated and the somewhat derelict station building there was replaced with one just like those built by the Midland Railway in the 19th century. 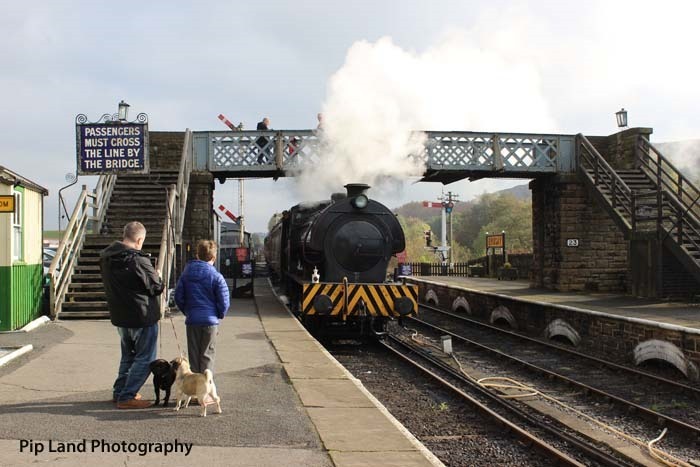 The station at Bolton Abbey is one and a half miles from the Abbey itself and so these days most people drive there and use the various car parks which we passed later. On our journey back home the day was drawing in providing very different colour-scapes to those we had seen in the morning. Our thanks to all the volunteers who have worked on that line, and to those who made our day so enjoyable. Below: Starting young!